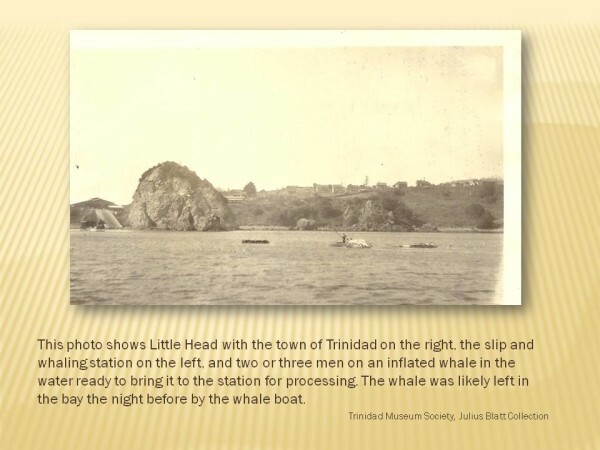 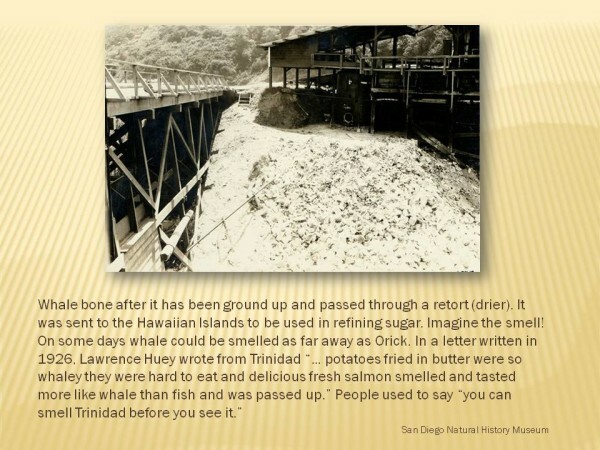 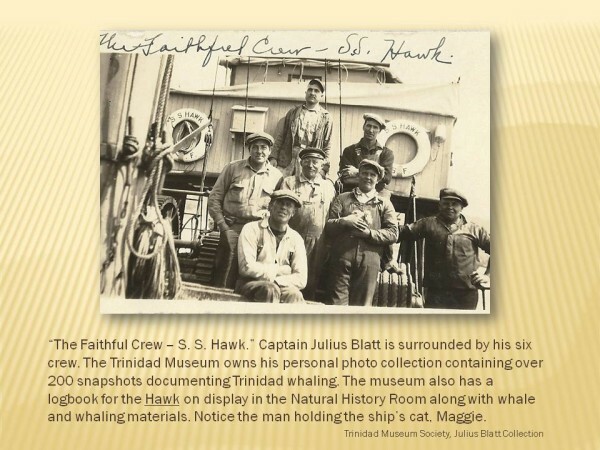 Trinidad had been eyed as an ideal location for a whaling station since 1851. 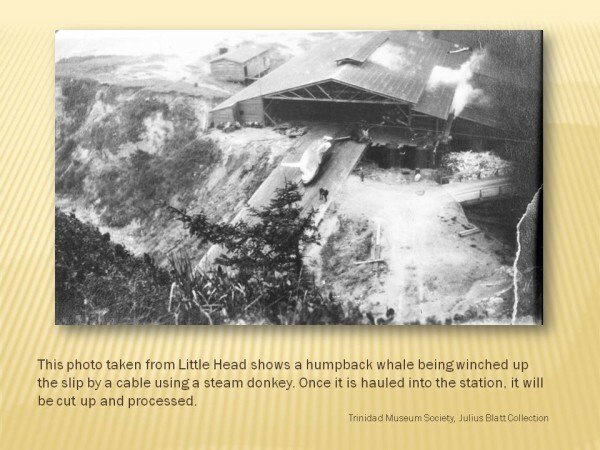 In fact, in the early 1860s a small station was set up in town. 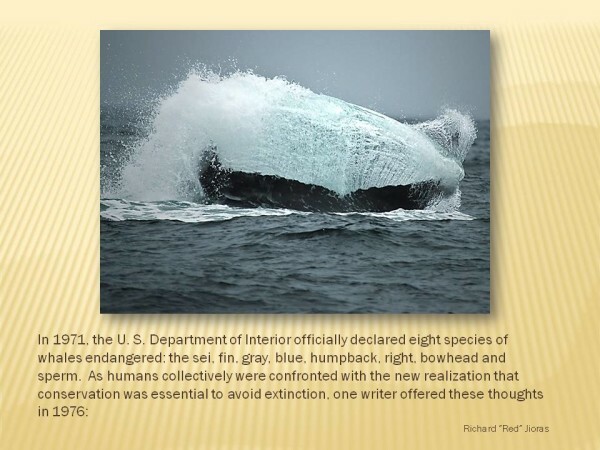 This didn’t last long as whales were already becoming scarce. 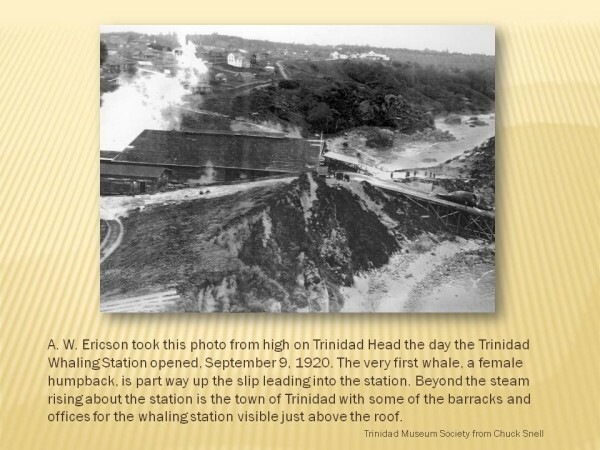 An effort to build a station in 1912 was approved by the Trustees of the Town of Trinidad but was sacked due to an outcry from local citizenry who feared that it would produce a terrible stench. 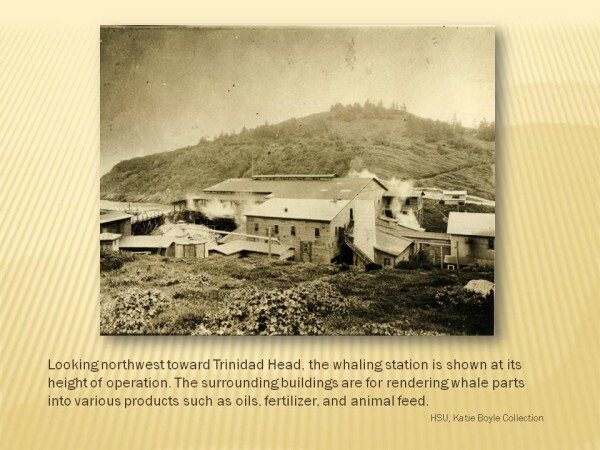 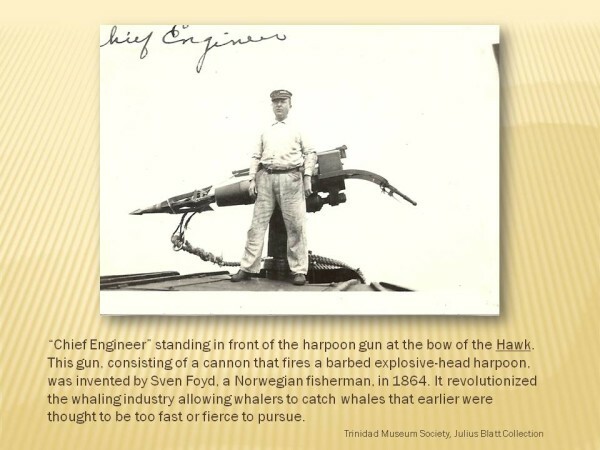 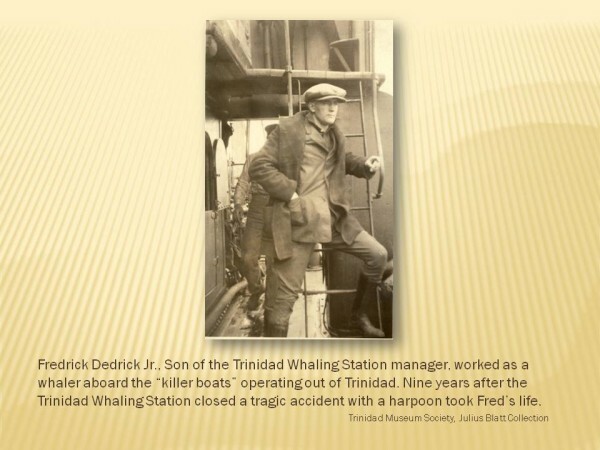 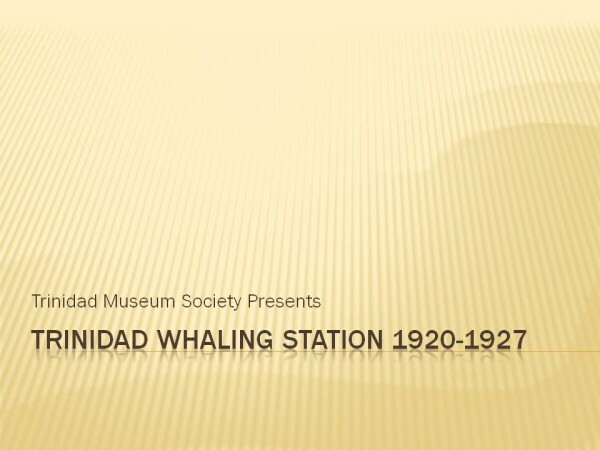 It wasn’t until 1920 that Trinidad’s whaling era really began when Fredrick Dedrick, a Norwegian master mariner and head of California Sea Products Company, convinced the people of Trinidad that his proposed station would be “sanitary and odorless at all times”, a statement that proved to be most inaccurate. 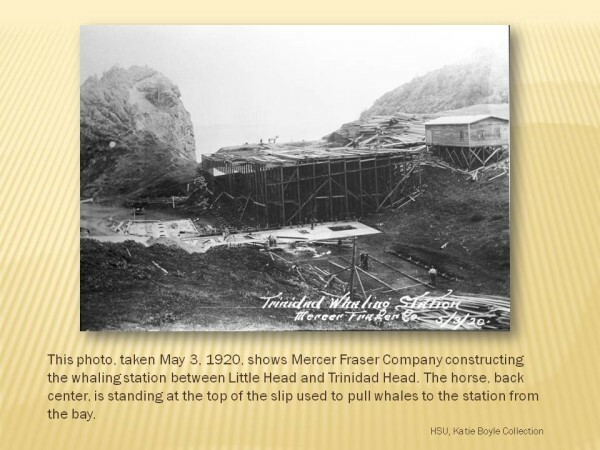 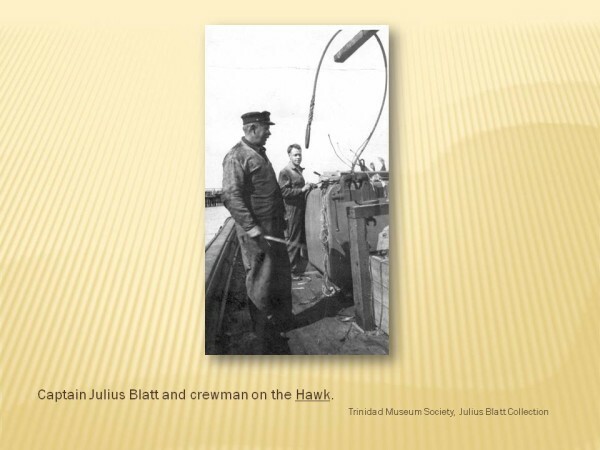 He contracted with Mercer Fraser Company to build a whaling station close to where the Trinidad Pier now sits. 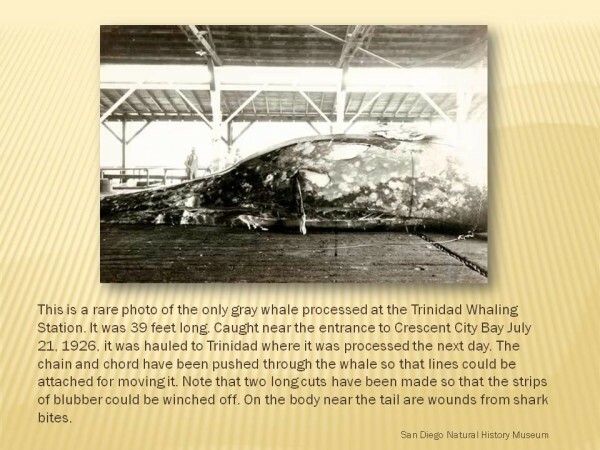 It cost nearly $300,000. 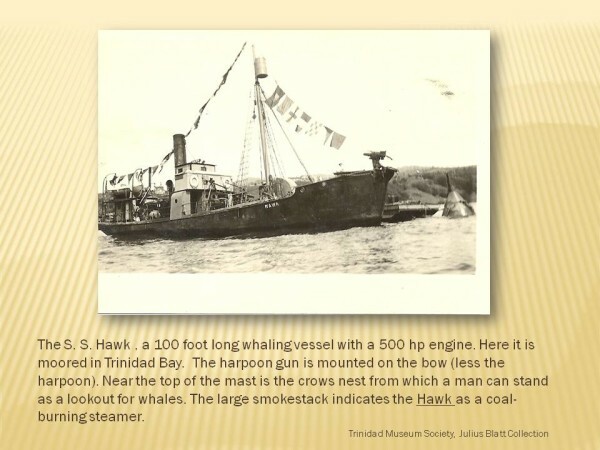 At its peak, the station employed between 35 and 60 men and eventually had a fleet of four “killing vessels”: the Hawk, the Port Saunders, the Traveler, and the Hercules.There were no restrictions on whaling at that time nor was there a season, but weather dictated that the station close during most winters. 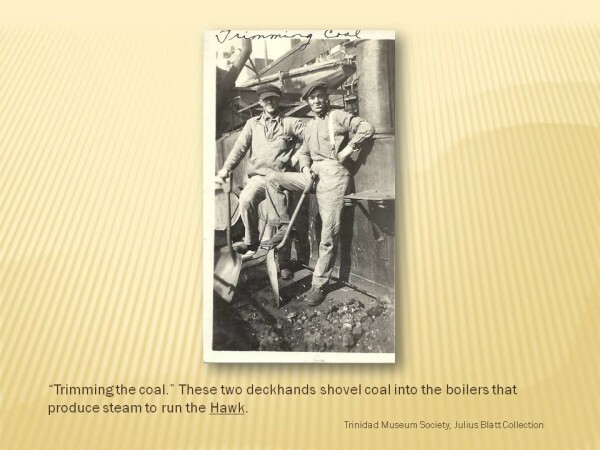 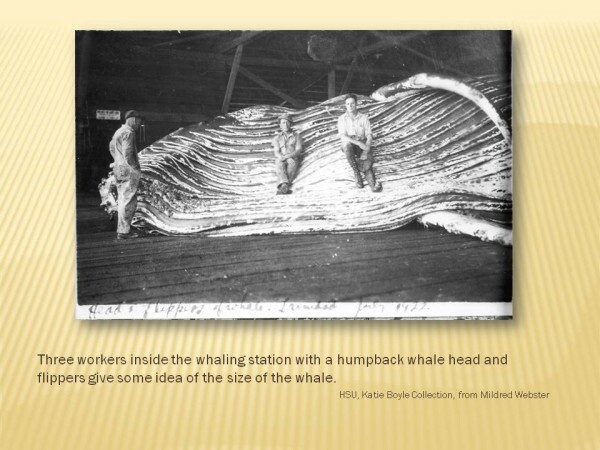 The steamers could capture up to 9 whales in a day, each whale averaging 50 feet in length and producing 50 barrels of oil. 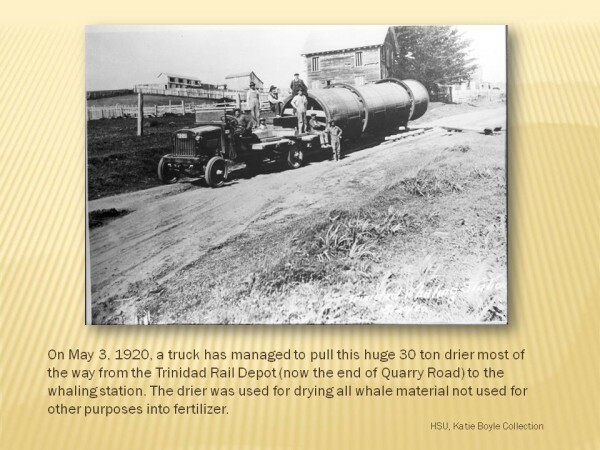 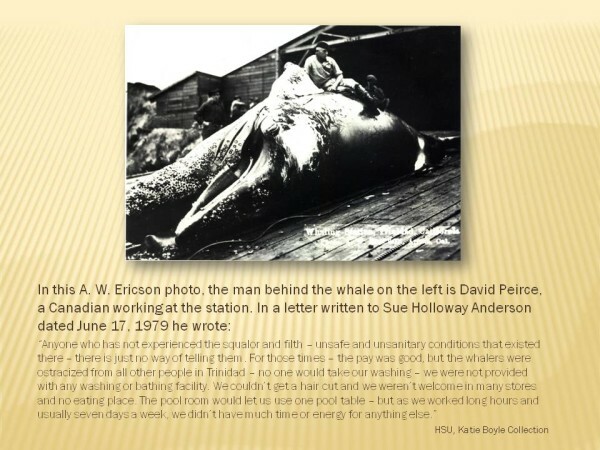 Other whale products included bone meal, fertilizer, and chicken feed. 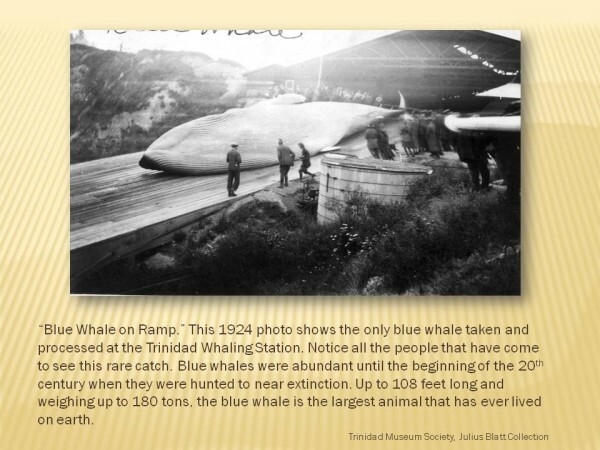 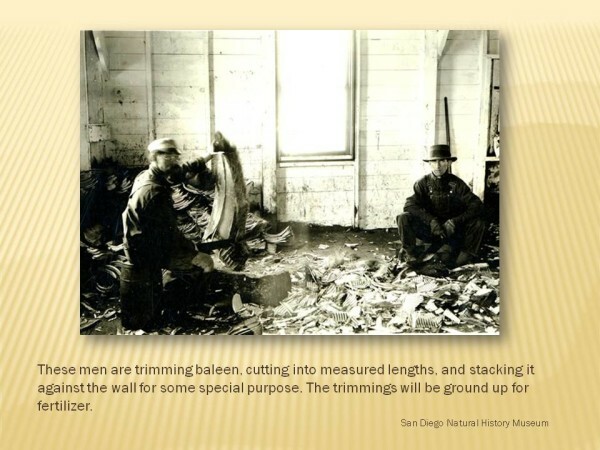 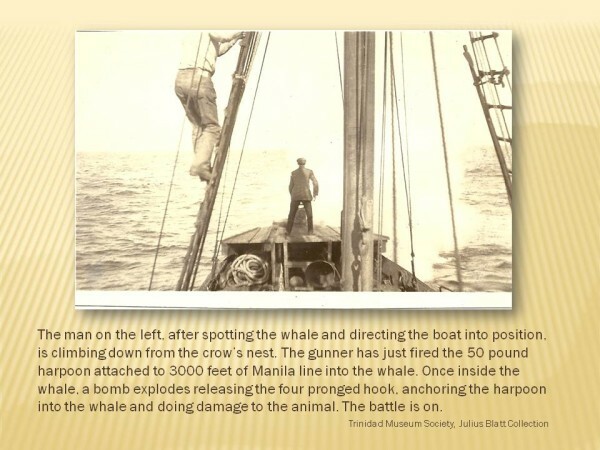 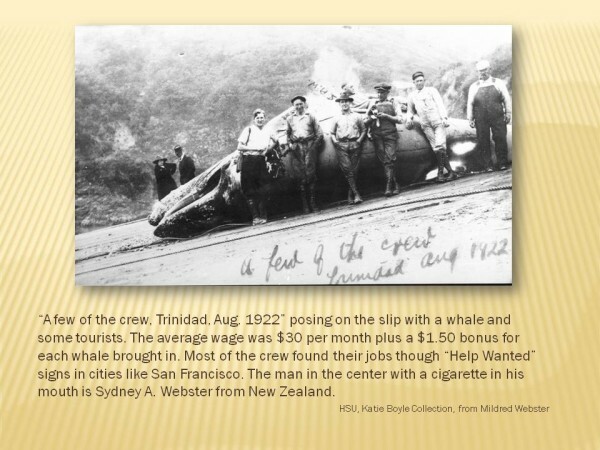 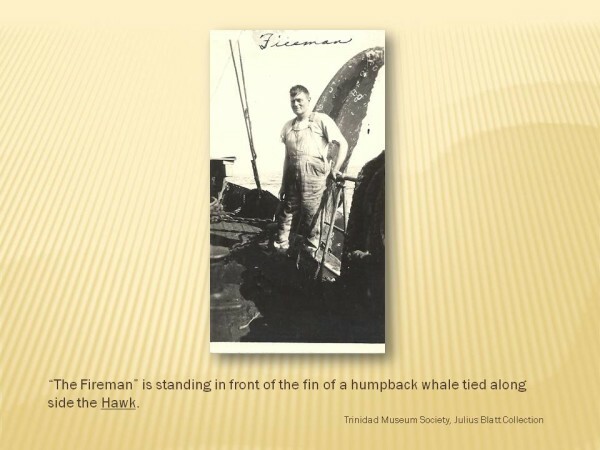 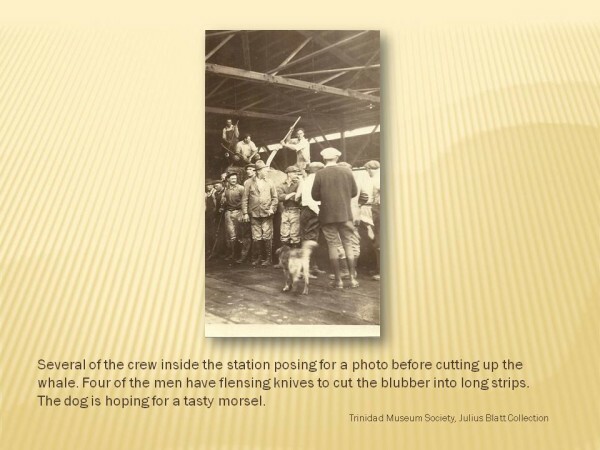 The declining number of total whales caught from 1924 to 1926, especially in regard to humpbacks, was one reason for closing down the Trinidad Whaling Station in 1927. 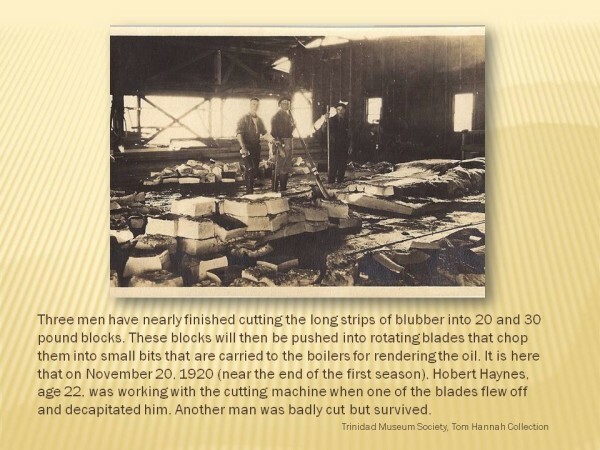 A second reason was continuing opposition from the town due to the horrible stench. 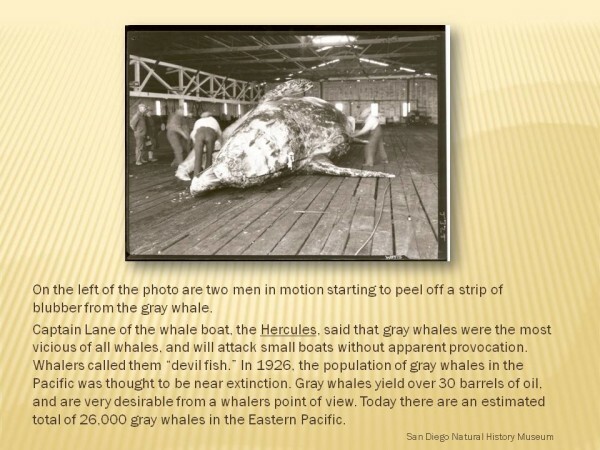 To overcome these problems, the company acquired an oil tanker, the Lansing, which they converted into a whale processing factory that could follow the “killing boats” and process the whales at sea. 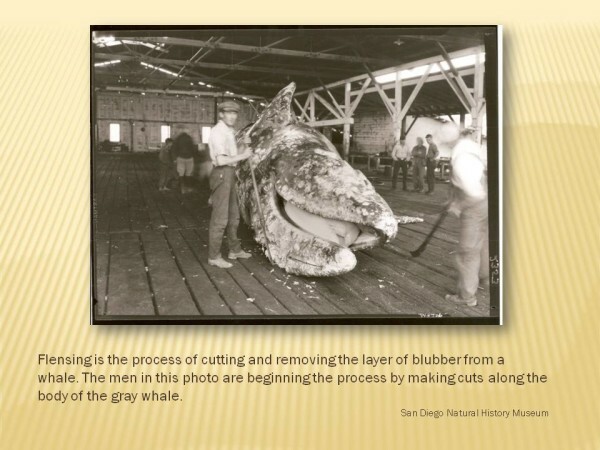 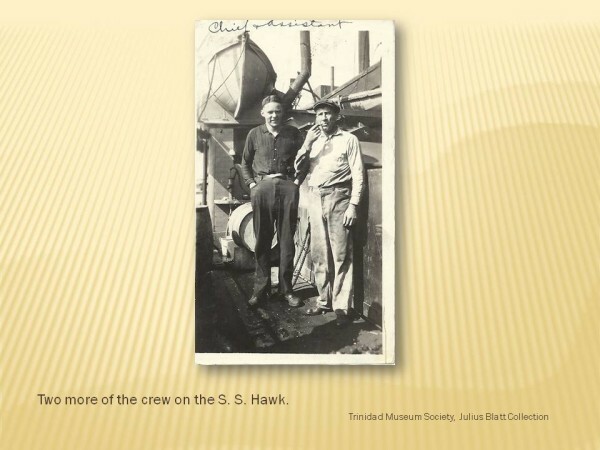 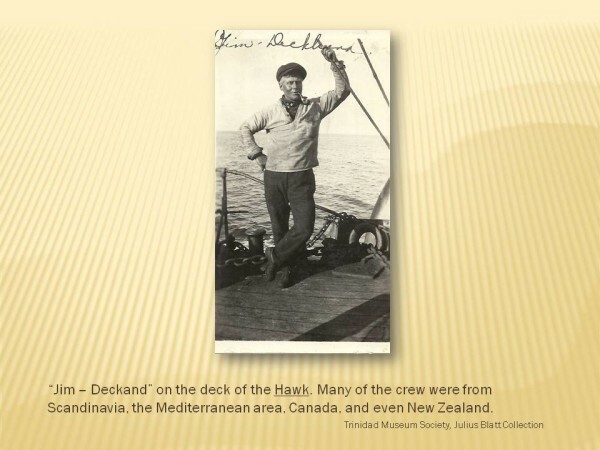 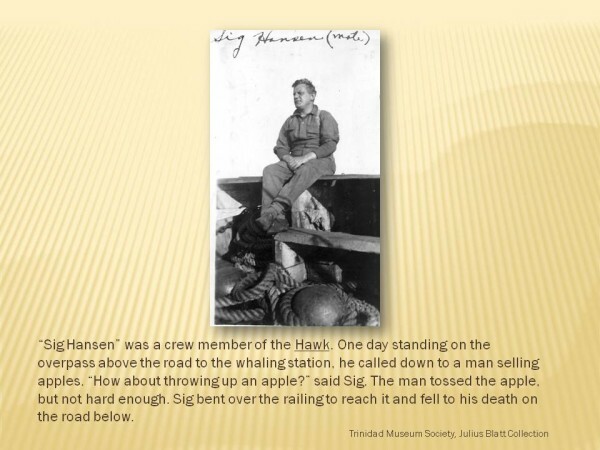 This allowed the boats to hunt farther, even as far away as Magdalena Bay, Baja, Mexico. 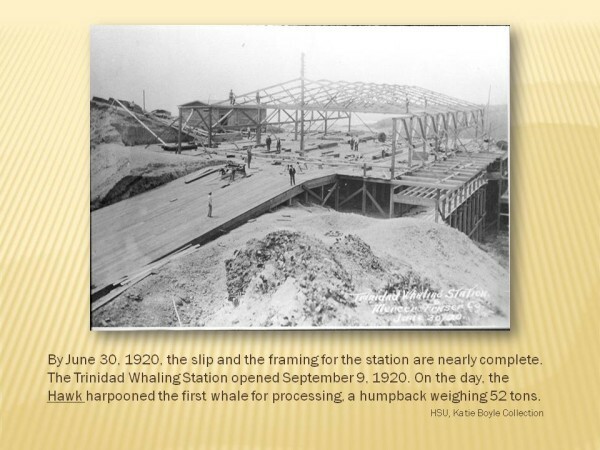 The station was torn down in 1930. 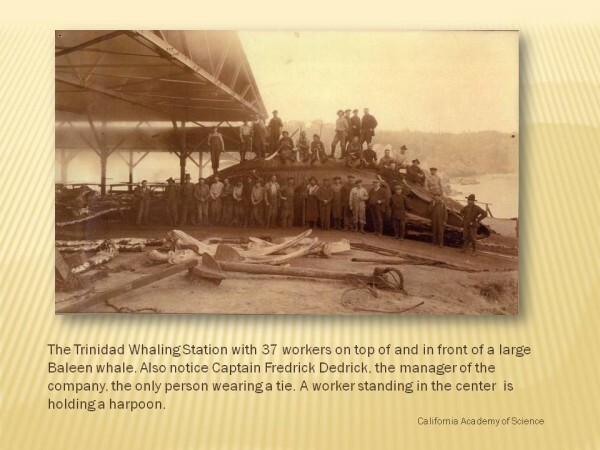 The boilers were sold to a creamery in Petaluma, and the wood was used to build a road around Trinidad Head to the lighthouse. 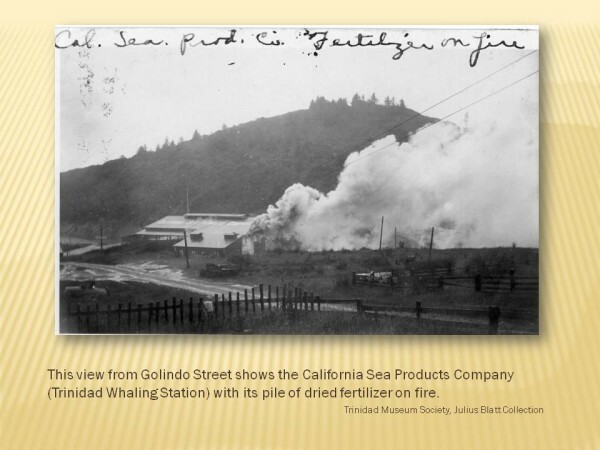 Today the site is covered by the Seascape Restaurant, the large paved parking lot, and the boat launch area. 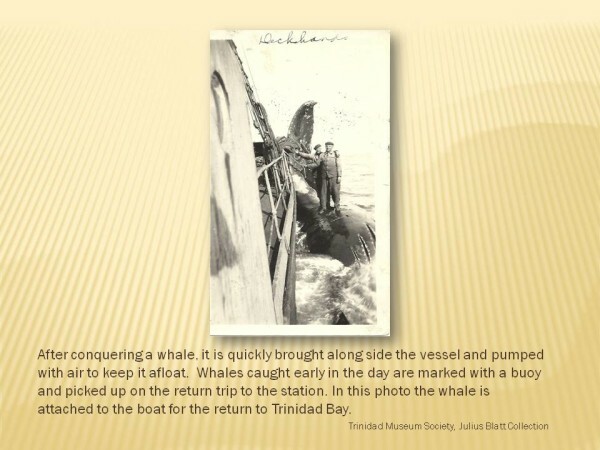 Trinidad whaling is just a memory. 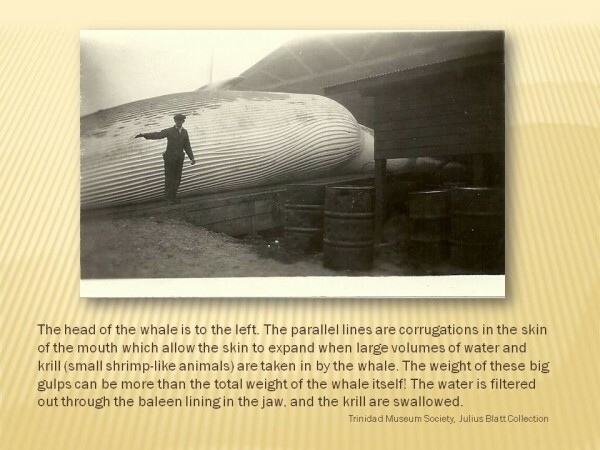 We now have a much better understanding and relationship with our fellow mammals, the whales. 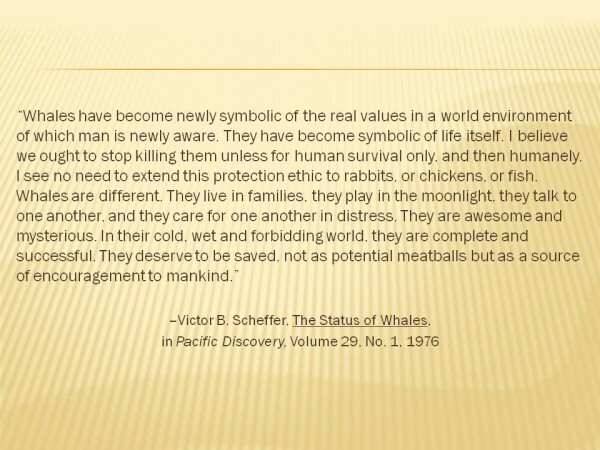 We can only hope that eventually humans worldwide will understand this special relationship and will cease hunting whales.